This article covers some of the tips and strategies that you will need to trade the forex market on a day trading basis. What is forex day trading ? Forex day trading is a style of trading currencies in which trade positions are opened and closed within the same trading day. So the aim of forex day trading is to be able to trade profitably within a few hours of each trading day. The dilemma is usually how to identify trade setups that have profit potential and how/where to setup the trade entries and exits. There is also the issue of how to manage risk, especially as new leverage regulations have been released for EU forex brokers who are regulated by agencies that are overseen by the European Securities and Markets Authority (ESMA). This will require some knowledge of how to do this, some information, tools and risk management strategies. The tips and strategies that you will use for your day trades are encapsulated in the use of each of these resources that will be discussed below. The economic news calendar is a schedule of news relating to economic indicators that affect the economies of various countries considered as key players in the global economy. Most of these news releases affect the United States, United Kingdom, China, Australia, New Zealand, Japan, the Eurozone and Japan. Therefore, the currencies of these countries will be impacted positively or negatively by these news. The economic calendar is a complete schedule. The current version of the MT5 platform has incorporated the daily schedule into its terminal window. You can also get a full monthly schedule from many sources. These will tell you when a news release is expected to be released (date and time), so you can plan your intraday trades properly. Traders are usually advised not to have active positions in the market until the news points to a direction where the trades should be going. One indicator that is created specifically for intraday trades is the pivot point calculator. Pivot points are daily support and resistance areas, calculated from the previous day’s high, low and close prices. The calculator does this automatically and plots these points on the currency charts of your choice. The pivot points are re-calculated every trading day. If you are using a static calculator, you should switch to the daily charts of your MT4/MT5 platform and back to the H1 chart to have these recalculated and displayed. Seven pivot points are defined: S3, S2, S2, central pivot, R1, R2 and R3. By trading the price behavior around these points, you will be able to find a good basis for entering and exiting trades within the same day. Never mind the names ascribed to the pivots: any pivot can be a support or resistance, depending on how it behaves in relation to the price action. The use of chart patterns and candlesticks is an integral part of day trading. Use of short-term patterns and candlestick patterns, especially when combined with pivot points, serves to increase the potential for increased accuracy in your trades. Common chart patterns are triangles, wedges, rectangles, head and shoulders pattern (and its inverse variety), etc. We also have candlesticks such as the engulfing patterns, harami patterns, evening/morning star, morning/evening doji star, three white shoulders/three black crows, etc. Trends are best visualized on long-term charts (weekly and daily charts). Traders are usually advised to trade with the trend until it ends. So your day trades have to tally with the overall direction of the currency you are trading. Indeed, even setups picked out from the long-term charts have to be traded with entries from the short-term charts. So you need to know what the overall trend is, then setup your day trade to follow that trend. If you are using a forex broker based in the EU, you would have noticed that leverage provision for forex majors and minors has been cut to 1:30 and 1:20 respectively. So if you have an account with an EU broker, it is going to be 20 times more expensive to open a trade than it used to. In any case, your total exposure should not exceed 3% of your account size. So what this will mean is that trading accounts have to be better capitalized to be able to handle the new requirements. Is there any news for the day that will affect the currencies in that pair (the British Pound and US Dollar)? What are the intraday support/resistance areas? What are the pivot point levels, and where is the price action in relation to these levels? If your platform has this function (e.g. the MT5), what is the Depth of Market information? What is the expected target for the intraday trade? What is the risk-reward ratio to be used for the intraday trade? This information must be put together and used in effecting the trade. No major news for the British Pound on the day in question. 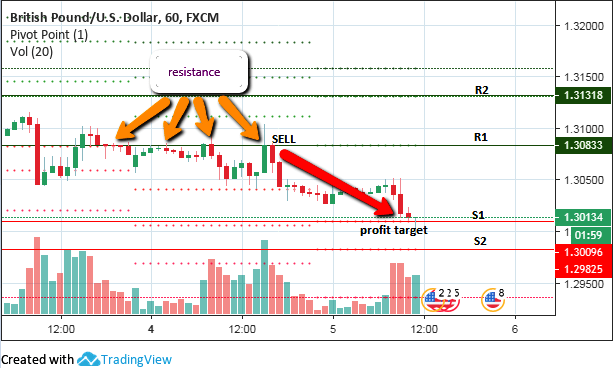 Pivot points are shown, with price being rejected several times at the R1 pivot resistance. Therefore, R1 would be a valid area to initiate a short order, with price target set at the S1 pivot. As it is, the move from R1 to S1 was a 70-pip move, which is a healthy profit for an intraday move.